Here is it, the second soundtrack I have uploaded to this website. 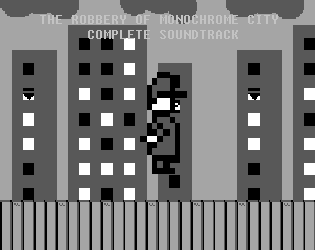 This is the soundtrack to The Robbery of Monochrome City, which was the first ever full game I uploaded to the site. This game was submitted to GBJAM5. The music is done by me, as always, and the downloads contain a zip of all of the mp3s, an nsf, and an ftm. Hopefully, the soundtrack will be better than the actual game was.